Last updated on April 14th, 2019 at 10:53 am. I check my credit report pretty religiously on Credit Karma. Why do I check it so frequently, you? Ohh, I’m not sure. I’m bored? I’m a nerd who actually finds it kind of fun to track? Yeah, both of those reasons are pretty accurate. 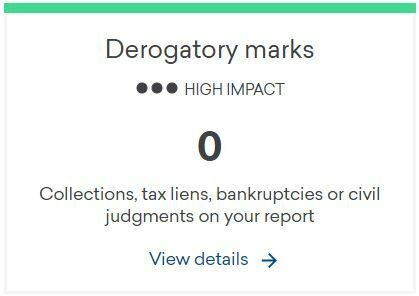 My derogatory marks on Credit Karma. Way to go, me. I never paid much attention to this item – probably because, as you can see, I don’t have any on my credit report. And while this item is fairly self-explanatory based on what you see in the above box, I wanted to know more. Derogatory marks are negative, long-lasting indications on your credit reports that generally mean you didn’t pay back a loan as agreed. For example, a late payment or bankruptcy appears on your reports as a derogatory mark. These derogatory marks generally stay on your credit reports for up to 7 or 10 years (sometimes even longer) and damage your scores. As I read this definition, I couldn’t help but immediately think of the economically disadvantaged. Here’s the thing – yes, it is entirely possible for someone who has the means to avoid financial disaster to get into that situation anyway. That could be caused by reckless spending, addiction, some major life event such as a sudden and unexpected health condition (especially in the US), and so on. And while I never like to play the blame game, at least the aforementioned people had some way to avoid financial disaster. 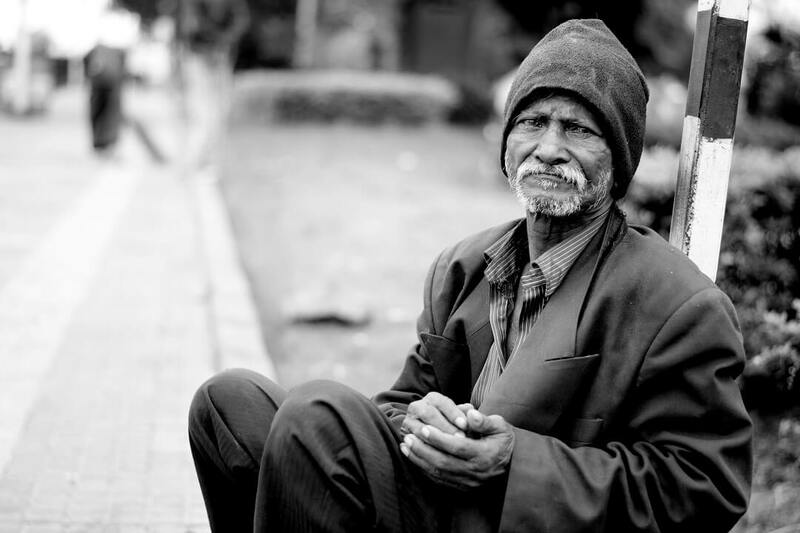 But what about the poorest of the poor? It’s one thing if someone destroys their credit rating through irresponsible spending on lavish items he/she doesn’t really need. But in reality, not everyone racking up credit card bills is using them solely for this purpose. For example, according to Value Penguin, consumers are 25% likely to use credit cards to cover recurring expenses. 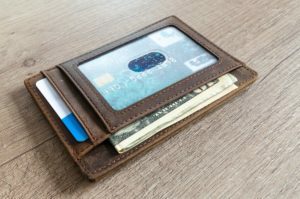 Sure, that’s well below online shopping, travel, and how likely consumers are to use credit cards overall, at 48%, 47%, and 44%, respectively. Still, given the steep interest rates on credit cards, it seems feasible that a low-income person could fall down a slippery slope. As I alluded to above, credit can also be very dangerous for low-income individuals due to high interest rates. 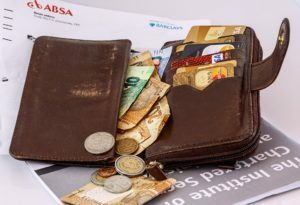 Certainly this makes sense from the perspective of the lender, but it can be catastrophic in the event that a low-income person is using credit to cover basic needs. One thing is for sure: “low and moderate income” (LMI) people rely on credit cards more heavily. That is according to a paper from Columbia University which reported on this topic. According to the same paper from Columbia, credit card debt is higher as a percentage of income share for LMI individuals. All other things being equal, that would suggest they are using credit cards to cover basic needs they can’t afford. Worse still, higher credit card debt tends to mean higher bankruptcy rates. While this could be a case where correlation doesn’t mean causation, it’s probably not just pure coincidence. Another lending practice which is particularly predatory in targeting low income individuals is payday lending. 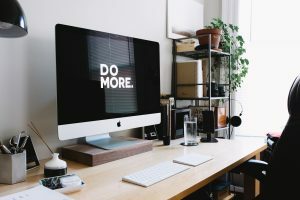 In case you aren’t familiar, payday lending is a form of lending in which borrowers are granted small loans – usually for a few hundred dollars. The issue, though, are the interest rates. The interest rates on payday loans are 400% on average. NPR has been covering payday loans quite a bit recently. They note that payday loans are often rolled into another loan. This is especially problematic because it causes the costs to spiral out of control. And since payday loans typically target the poorest of the poor, it’s likely those people would be unable to pay the loans back on time. One of the biggest reason payday loans have been in the news a lot recently is due to a proposed change to consumer protections. As NPR reported, a rule created by the CFPB under the Obama administration would have made it more difficult for people to get payday loans. Under the proposed rule, lenders would have to show that borrowers could pay back the loans as a stipulation for borrowing. But the rule never took effect, and the CFPB under the current administration looks to take the rule off the table completely. I think it is fairly self-explanatory why not having to prove a borrower can repay their loans is potentially dangerous. I’m afraid I don’t necessarily have an “actionable” recommendation with regard to these issues. But you may have heard that 26 billionaires are now as rich as half the world. While the control you and I have over this issue is limited, there are some things we can do. Perhaps donate to a charitable organization that helps the economically disadvantaged. Some politicians have also promised to narrow the widening income inequality gap. Whether you trust their ability to make good on that promise is for you to decide, however. In true Dave Ramsey form, if someone is struggling to make ends meet, I would probably recommend relying more on cash and less on credit. That won’t always be possible, but the more they can shift things over, the better. Yep, it was great. Will be dropping some posts about it soon! Excellent post. Payday loans are absolutely predatory, but from what I’ve read also, as they’ve gotten harder to get, credit cards have become the next option. Still not great rates, but nowhere near 400% at least. But also harder to use for cash in a pinch. Like you, I’m not sure what the answer is here. Maybe…I’ve just been worried with the current administration trying to lift consumer protections related to payday loans. It makes me sick!